Loaded with good-for-you stuff, our hearty Wild Rice Salad is quick and easy to make for a wholesome lunch or dinner. Featuring one of winter’s brightest stars on the produce scene, Florida Strawberries, this Healthy Family Recipe is not only good for you, but it is beautiful and delicious too! This post is sponsored by Florida Strawberry in conjunction with a social media campaign through Sunday Supper LLC. All opinions are my own. We’re all aware of winter citrus, right? Can you even think of clementines without thinking of Christmas?? But did you know there’s a winter strawberry, too? And that it is equally packed with Vitamin C? These juicy, red strawberries come to us from the sunny state of Florida and are available NOW. Florida’s growing season runs from December through April which may surprise some East Coasters who think of strawberries as a summer fruit. Florida is the country’s second largest producing region in the country. This means our long, dark winters can be chock full of these sweet, red gems if we look for them at our local grocers. Which makes me so happy. Winter is haaaard, especially when it comes to produce. I mean, I love roasted root vegetables as much as anybody but can you have them every night? I can’t. So I set out to create a savory salad using plenty of strawberries to get me through this frigid weather with my health in tact. Adding Florida strawberries to a recipe is an easy way to pack some nutrition into your day. Not only are Florida strawberries loaded with Vitamin C, they’re also high in fiber, folic acid (calling all pregnant ladies!) and potassium (great for your blood pressure.) They’re low in calories and some research indicates strawberries may help fight cancer and heart disease. There are sooo many reasons to stock up on fresh Florida Strawberries right now. They’re like these little beacons of hope in a long, cold season. And this recipe will help us incorporate more of them into our diets. There are a lot of sweet strawberry recipes out there. Like this Vegan Tapioca Pudding with Rose Water and Marinated Strawberries and these Grilled Pound Cake Stacks with Roasted Strawberries. But their flavor lends itself to savory dishes as well like this Strawberry Salad with Gorgonzola Cheese or this Quinoa with Salmon and Strawberries. 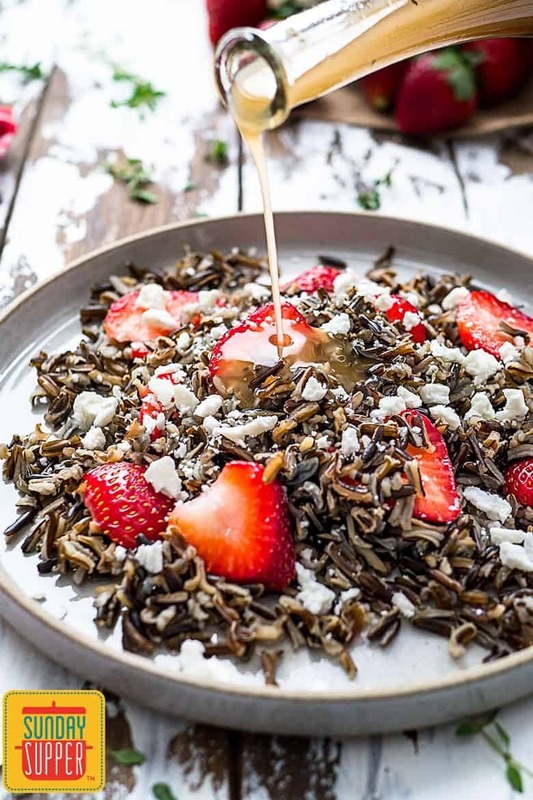 So that’s the direction I headed in with this Healthy Wild Rice Salad with Strawberries. The salad recipe itself only requires three ingredients. 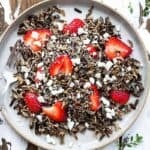 And the Sherry Thyme Vinaigrette only needs three more making this a very simple wild rice salad loaded with nutrients and bursting with flavor. This is a pretty hearty little number. We are in winter after all. I wanted this salad to reflect that and celebrate the Florida Strawberry in all its winter berry glory. I achieved that by combining the earthy grain of the wild rice with the woodsy flavor of thyme. The Sherry vinegar brings out the natural sweetness of the strawberries and the feta brings everything together with its briny, salty character. A substantial strawberry salad indeed. Feel free to use even more strawberries than the recipe calls for. They are the star of this dish. Strawberries look and taste best when you de-stem them and then slice them, very thinly, from top to bottom. Try to get three to five slices out of each berry, depending on its size. I am usually a fan of serving salad dressing on the side and letting people dress it themselves. But this dressing tends to separate quickly. So I serve this wild rice salad pre-dressed in one big bowl and toss it really well before setting it on the table. 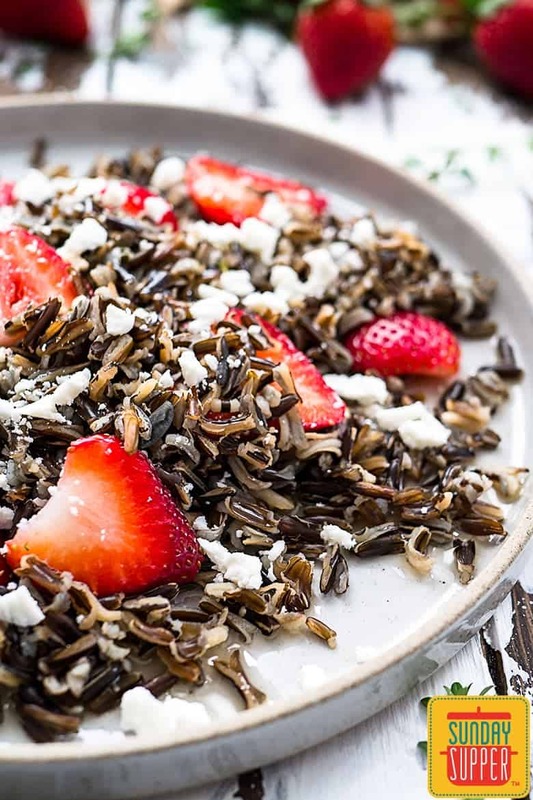 One cup of uncooked wild rice will yield enough cooked rice to make this salad. Technically, one serving of wild rice is ¼ cup. When we have this salad at home, my family of four almost always dishes out way more than that so the portions in this recipe reflect that. We also usually make enough to have leftovers. Leftovers are amazing for lunch. Consider adding protein (chicken and salmon work great) and maybe some pecans! If you’re hungry for even more recipes including fresh Florida Strawberries there are tons on the official Florida Strawberry web site. They also have great tips for choosing the best berries and for storing them. Combine all ingredients in a salad bowl. Make dressing by adding vinegar, thyme, salt and pepper to a small bowl and whisking in the oil in a steady stream. Dress salad and toss well to coat. Cooking one cup of dry wild rice according to package instructions will yield enough cooked rice for this recipe. Prep time here does not include the time for cooking the rice. I haven’t made any wild rice yet this year—this wonderful salad will be first up! I love how you updated this recipe with strawberries! It looks terrific!!!! Such a pretty rice dish! I would never have thought to pair rice and strawberries together. I love wild rice. This sounds so good with a strawberry kick! 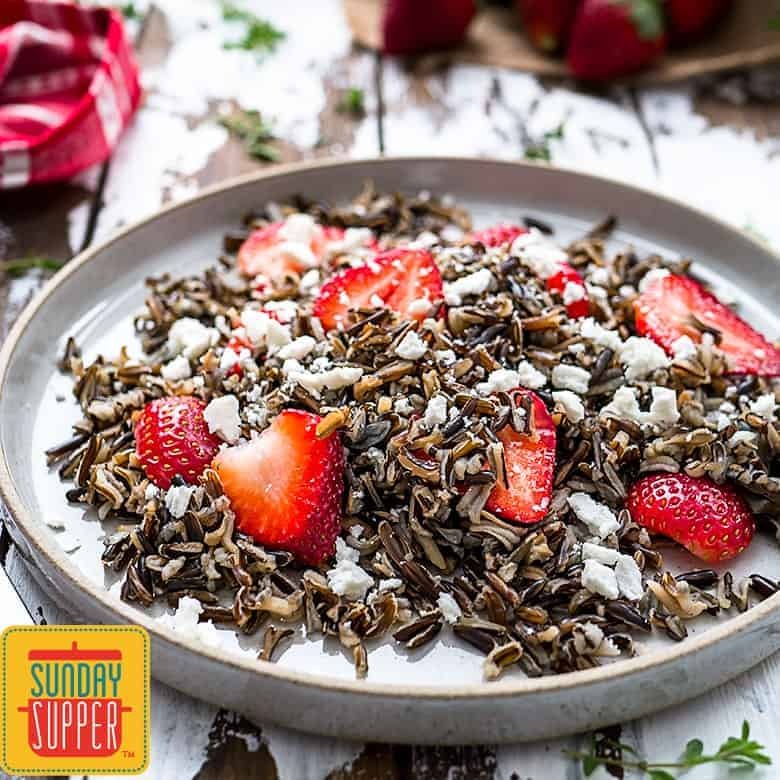 I’ll bet the nutty flavor of the wild rice pairs nicely with the sweet Florida strawberries! Such a pretty, yet simple dish – love the sound of the dressing. Loving the different flavor combinations at play in this salad! I need to make this, stat!